In our previous review of top Japanese pencils, it was lamented that the Pentel Black Polymer 999? was unavailable. We did review, and have previously looked at, the second tier 999. “Second tier”? The 999 is without doubt one of the finest pencils ever made, so we’ve been extremely curious about what Pentel considers to be even better! There are now a few vendors that sell Japanese pencils internationally. Despite numerous enquiries over a period of years, no vendor we’ve contacted has been able to obtain this pencil. The only online evidence that this pencil ever existed seems to be a few small photos and statements here and there. With thanks to the resourcefulness of isu of the uncomfortable chair, it is now possible to finally examine this pencil. 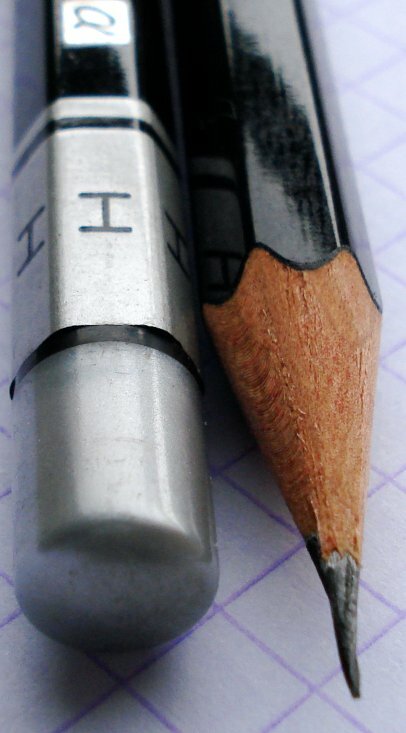 In grade ‘H’, two pencils were obtained. Here we invoke the ‘to have and to hold’ philosophy – keep one ‘as is’, and use, enjoy, test, write, with the other. Pentel does not have their own woodcase pencil production facilities – these magnificent creations are apparently all subcontracted. Well, Pentel must be a first rate contract manager, because their products have turned out very well. The 999? is a glossy black pencil with silver lettering and accents. The varnish quality is excellent. The pencil cap itself seems highly curious – possibly some sort of plastic or resin. “Supreme quality” is a major boast, but if any company could deliver, it would presumably be Pentel, known for many lead and mechanical pencil achievements. It being a pencil that likely exists in limited numbers, one was carefully sharpened in the “regular” slot of a Tombow SM-200WN sharpener. It sharpened to a very fine point – which after several days of occasional use – has not yet broken. ‘H’ leads are outside our usual frame of reference – we know they are useful for many drafting and drawing purposes, but are typically harder than we would prefer for general writing/sketching. To establish a context, two Staedtler Mars Lumograph 100 pencils in H were also tested – one new (silver lettering, bar code), and one perhaps five to ten years old, with white lettering and no bar code. The two Staedtler pencils did not seem the same – the older one appeared to leave a fainter line. Compared to either Staedtler pencil, the Pentel seemed to leave a richer, darker line, and to be extremely sturdy – combining a fine sharpening capability with great non-eroding durability . 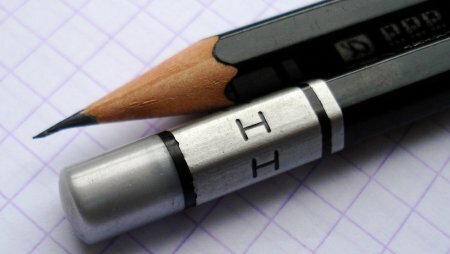 If ‘H’ pencils generally came like this, they would be loved by many. Drafting-only pencils are somewhat out of our element, but nothing observed indicates that the 999? isn’t indeed of ‘supreme quality’. In addition to Tombow and Mitsubishi, there are other quality Japanese pencil manufacturers. One of these is Pentel. Their top of the line pencil in the Black Polymer series is the 999 alpha. I’ve heard they are great, but have been unable to acquire any. (If you have some for sale, please let me know!) But, I did come across some of their still very fine 2nd rank pencil, the 999. Distinguishing the two pencils is easy – the 999 alpha has the Greek alpha character in the pencil name, and the slogan “supreme quality for lines of highest density.” It has a glossy finish with the grade printed in black on a silver background. The regular 999 has the more modest slogan “the highest quality for general use”, and less use of silver. The finish is matte, and the top of the cap is painted silver. Matte vs. glossy sounds like a photo finishing or interior wall paint choice. But it seems it’s also a pencil choice, and Pentel chose matte for the 999. It is very pleasant to hold, looks good, and is not too common in pencils. I have some Lyra pencils with a similar finish, and can’t think of any other manufacturers that have chosen this type of finish. The silver accents on black paint make it one of the most attractive on the market – up there with the Grip 2001 and Nava. The box it comes in also looks nice for a cardboard box – there is something very adult and stylish about the presentation. The pencils sharpen easily. The lead is not as rich as that of the other Japanese pencils mentioned here, but still nicer than average. It makes an excellent writing pencil, and goes very nicely with a black journal.